Selected by Smithsonian to host exhibit about diversity. Exhibit available for school field trips. The Smithsonian Institution Traveling Exhibition Service (SITES) has joined the educational organization Facing History and Ourselves to dramatically increase access to the themes and content in its national initiative Choosing to Participate with a set of 11 posters designed to encourage dialogue, engagement, respect and participation in classrooms and communities. The Smithsonian (SITES) selected and invited the Museum of Lifestyle & Fashion History (MLFH) in <?xml:namespace prefix = st1 ns = "urn:schemas-microsoft-com:office:smarttags" />Boynton Beach, Florida to host and present the poster exhibit for the Palm Beach County area. The Smithsonian selected MLFH because of their history of hosting Smithsonian exhibits that have diversity topics. MLFH began hosting SITES exhibits in 2001 and since that date has hosted 7 of their exhibits including the current display. MLFH�s first Smithsonian exhibit was hosted at the School District of Palm Beach County in West Palm Beach at the FULTON-HOLLAND facility. Wade in the Water: African American Sacred Music Traditions showcased in 2001 at the School District headquarters. MLFH did a curriculum infusion partnership with the African American history department. Developed for middle-school and high-school students, the posters are intended to inspire people of all ages to create positive social change. The posters present the experiences of individuals and communities, explore the history and impact of racism and prejudice, and encourage viewers to consider the consequences of everyday choices�to discover how �little things are big��and to make a difference in their own communities. Founded in 1976, Facing History and Ourselves is an international educational and professional development nonprofit organization whose mission is to engage students of diverse backgrounds in an examination of racism, prejudice and antisemitism in order to promote the development of a more humane and informed citizenry. By studying the historical development of the Holocaust and other examples of genocide, students make the essential connection between history and the moral choices they confront in their own lives. SITES has been sharing the wealth of Smithsonian collections and research programs with millions of people outside Washington, D.C., for nearly 60 years. SITES connects Americans to their shared cultural heritage through a wide range of exhibitions about art, science, and history, which are shown wherever people live, work and play. The Museum of Lifestyle & Fashion History is located inside a donated 8,000 square feet facility inside the Boynton Beach Mall at 801 N. Congress Avenue, Suite 483 (Inside Mall in Near Sears), Boynton Beach, FL. 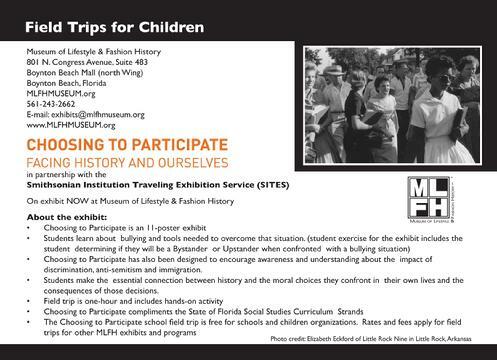 For more information, call: 561-243-2662 or e-mail: exhibits@mlfhmuseum.org. The exhibit is free at MLFH for school field trips and includes activity worksheets.